Toastmasters International started more than 100 years ago to help members improve their public speaking and how they conduct meetings, among other leadership skills. 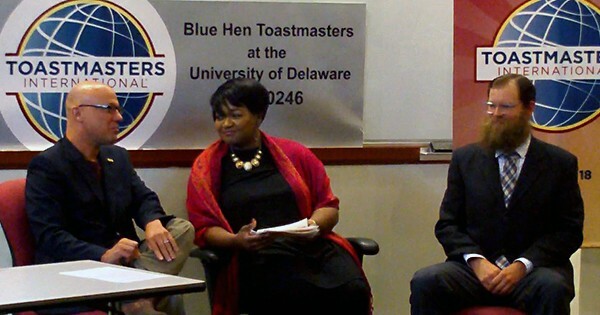 The new Blue Hen Toastmasters club at the University of Delaware follows in those footsteps. Alex Brooks, UD MBA student and president of the Blue Hen Toastmasters, said he loves that the club offers a low-pressure environment and a positive setting for members to improve their public speaking skills. New Castle County Executive Matthew S. Meyer and Newark Mayor Polly Sierer issued proclamations recognizing the club at its chartering ceremony in September. Toastmasters is open to undergraduates, graduate students, faculty members and people from the greater Newark area. Nearly half of the members of the club are international students. Brooks said the wide variety of club attendees greatly benefits all involved. “This diversity allows for people to share their experiences and pick up new stylistic tools that can be incorporated into their unique presentation technique,” he said. Brooks said he has enjoyed seeing members improve in their public speaking since the club opened earlier this year. For some members, English is a second language. Helping individuals will help the student community grow, Brooks said. “We want to be able to increase the speaking confidence of international students while simultaneously bridging the gap between the international and domestic student populations,” Brooks said. Jack Baroudi, senior associate dean of academic programs for UD’s Alfred Lerner College of Business and Economics, said Toastmasters helps students to develop crucial skills that they will carry through into their chosen career paths. During club meetings, each Toastmasters member gives a three-minute speech and is given feedback immediately. This includes identifying grammar mistakes, filler words such as ‘um’ and ‘like,’ and use of colloquial language. Feedback like this helps all members to improve their public speaking skills, even those who joined the club with already strong abilities. Brooks said that has also seen students grow their presentation styles and leadership qualities. “Even the most confident speakers have been able to tweak their style in order to become so much stronger in their delivery, connection with the audience and gesticulation,” he said. Brooks said that he sees a bright future for Toastmasters as the club expands among University students and facilitates personal and professional growth for each member. For more information about the Blue Hen Toastmasters Club, visit the Blue Hen Toastmasters Facebook page.